A report on Tuesday illustrates Apple's struggle to offer high quality after-sales service to customers in India, a product for which the company is known globally but is unable to provide due to strict retail laws in the country. 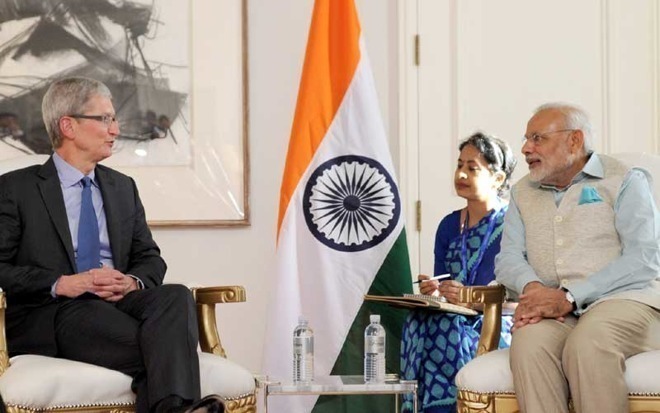 Apple CEO Tim Cook (left) meets with Indian Prime Minister Narendra Modi. A recent survey conducted by Mumbai-based analysis firm RedQuanta found customers are less willing to recommend Apple products and services than smartphone competitors Samsung and Xiaomi, reports BuzzFeed News. After interviewing 550 customers at 80 authorized service centers, RedQuanta assigned Apple an abysmal score of -22, one of the lowest logged by the analyst. Offering perspective on the score, RedQuanta associate vice president of sales strategy Anushree Tapuriah said any rating above zero is considered "good." Apple received low marks for customer satisfaction, issue resolution and empathy of store staff to customers and their problems, with 60 percent of respondents calling employees of authorized shops "arrogant," the report said. "The entire process seemed very transactional and non-personal, which isn't expected from a brand like Apple in the rest of the world," said Tapuriah. Apple does not operate first-party stores in India due to government regulations that require foreign retailers to source at least 30 percent of goods sold from domestic suppliers. This means customers are deprived access to the Genius Bar and first-party service centers, forcing them to rely on third-party providers that are not managed directly by Apple. Speaking with Apple customers in the region, BuzzFeed paints a bleak picture of Apple's support structure in India, one that stands in stark contrast to the typically positive experience enjoyed by users in other countries. Authorized service providers are supposed to follow Apple's after-sale policies, though some reportedly sidestep warranties and enact their own pricing by erroneously claiming devices are damaged, the report said. Customers sometimes complain of long turnover times for relatively routine repairs like battery replacement, a process that can be completed at an Apple store in under a day. Managers at repair chain iZenica blames the delays on Apple, which requires third-party shops order parts direct. Owners of out-of-warranty products are perhaps more susceptible to the whims of networked service chains. As they are not bound by Apple's pricing policies, authorized repair shops are free to charge markups on parts or charge diagnostics fees, the report said. Further, certain service providers in India do not guarantee that the repair of an out-of-warranty device will be successful. The situation is so fraught with uncertainty that customers are at times compelled to reach out to Apple directly. It appears, however, that Apple's hands are tied. In one email correspondence highlighted by BuzzFeed, a customer was told to service their outside of India or, alternatively, send it to an acquaintance living in a country where direct Apple servicing is available. RedQuanta's survey arrives at a pivotal moment for Apple, which is scrambling to find a growth strategy to offset slumping iPhone sales in China. India was a potential stand-in, but recent estimates at the end of 2018 placed Apple's share of the Indian smartphone market at a minuscule one percent, down from two percent a year prior. Reports suggest revenues are also far off Apple's expectations, with the company generating $1.8 billion over its fiscal 2018. Executives were shooting for $5 billion in revenue by 2020. Apple is working to bring its own retail operations, and with it repair outlets, to India, but negotiations have yet to bear fruit. In January 2018, India loosened its sourcing requirement for single-brand retailers, potentially paving the way for official Apple stores in the country's most populous cities. Currently, however, India customers are still served by locally owned and operated authorized resellers. In the near term, Apple is reportedly looking to open so-called "premium" franchise stores to better serve its customer base. Still, with comparatively high prices due to import taxes and a less than stellar reputation for after-sales service, Apple faces an uphill battle to make a splash in the world's second-largest smartphone market. Anecdotal example. In South East Asia ,I just got my iPhone SE battery replaced at an Apple Authorized Service Provider. It took 3 hours. My total bill was $35 74 cents. The folks were pleasant & friendly. I tried out the XR, XS Max 2018 iPad Pros along with the iMac 5K. I would say my experience was a 4/5. Sounds like Apple is being set up to fail in India. Presumably Apple’s competitors are operating under the same retail conditions, yet in this survey they have scored much higher. It would have been useful if the article included a relative price comparison with the roughly equivalent competing products. Seriously though, it sounds like a tough place for a foreign firm to do business. The third party shops know the customer has money and they’re taking full advantage. This is exactly why I campaigned so hard for Apple Retail Stores in Spain years before they even became an executive idea, much less a physical reality. I set out the case for retail stores as the only way forward for Apple outside of the US as Apple itself was the only company with the necessary resources to turn things around. At that time, long established Apple resellers were closing down all over the place and there were a raft of other issues that were hitting Apple head on and not getting resolved. Distribution of Apple products was centering on small chains who knew they had customers penned in and there were few competitive alternatives. The amount of complaints in the letters section of MacWorld was increasing and on the first internet forums that were just establishing themselves back then. All of the issues in this piece were real issues back then. Apple countered that there was no easy solution as opening its own stores would put Apple in direct competition with the resellers, to which I countered that the resellers were a huge part of the problem. In the end Apple pulled the trigger on Apple Retail Stores and much to our astonishment, they opened in the US first, precisely where they were not needed as much. This was confirmation to many that Apple really wasn't understanding the Mac world outside the US. Eventually they branched out into foreign markets and their success has been acknowledged but it was a huge struggle to be heard back then and very frustrating to see Apple plod on as if nothing could be done. Today, with billions to spare Apple could really do much better in developing markets. I thought that Apple had begun manufacturing iPhones in India so that the restriction based on local sourcing had been lifted. Not so? Well. 9/10 Apple products in India, Bangladesh & Pakistan come from unauthorized sources. So , obviously people have choices. The Apple Authorized Service Providers now have to service out of country Apple products too. Yes, this is actually an advantage nowadays. Years ago it was basically only laptops that had international warranties. iPhones didn't exist and desktops had to be warranty serviced in the country of sale. Now that Apple has far more mobile devices, where they come from isn't as important as the sale itself. However, the underlying reasons for having retail stores (in this case) was never 'the sale itself'. It was the presence, the showroom, the support and direct communication with the mothership. Having a visible, high foot traffic showroom for your product. In many ways, aftersales attention is more important than the pre sales attention. The support you receive, the answers and in general how you are treated. It always makes me have reservations whenever I criticise Apple Retail because I remember what it was like in the bad old days but criticism is the only way Apple usually responds. Of course, There are reasons why people source Apple products abroad and those reasons have to be tackled somehow. The first step should be getting great retail stores into the best locations. They don't have to be huge flagship stores but they must be a safe haven for the user and sow the seeds of future Apple users. As developed markets reach saturation point, features are now commoditised and competition is fierce, Apple needs to enter developing markets but adapt strategies to the realities of those markets. India has no concept of customer service, so these numbers are not at all surprising. There's almost no incentive for customer sales/service people to learn about the product they're selling/supporting. I worked in retail, and we had training sessions, and prizes/bonuses for learning about the products we sold. Here in India, they'll just look at a box and read what it says; that's their concept of "customer service". The reason Samsung, LG, and others fare better than Apple is because they are more familiar brands. Apple is still seen as an "elitist" product here, and so there's very little in the way of infrastructural support. Stores sell Apple products, but no one in the stores really knows anything about them. If Apple wants to succeed in India, they have to go "all-in". Have a number of Apple sales/support experts transplanted to India—essentially to be Apple Ambassadors in India, to elevate the brand, give free customer workshops/communities, etc. Indian government bureaucracy, and Indian culture of mediocrity are the biggest obstacles for Apple to overcome. People won't buy Apple products here if they're marked up 50%, with little to no support. And India will mark up products not sourced here. And Apple won't build or source products here until we have a better sense of quality control. For as long as India has been an independent nation, we have been amazingly resilient; but that also means that we're willing to simply "make do" with what we can; we don't have super high standards or a culture of independent thinking or innovation. Upper class Indians want top-quality stuff, but aren't willing to support the infrastructure to build that stuff here. For the last 10 years, Apple has taken a half-assed approach to the Indian market. If Apple wants to succeed here, they need to go all in—to take a $1 billion (minimum) risk in India, probably per year, for five years, before they'll see any traction or ROI here. They need to continue to lobby the government to grant them tax/import breaks; at the same time, India needs to stop being stupid about the "Only in India". I mean, it's great that we want to support Indian workers and Indian business, but we also need to improve our work culture. We need a corporate culture that looks at lifestyle; not merely money. We need to create financial incentives for the smartest Indians to stay in India, rather than take their brain-power and creativity to the UK, the US, and/or Canada. It's a big ask, but I think it's the only way this will work. Deja Vu - A few years prior to the launch of Apple’s stores, I worked for Apple on a retail research project that analyzed the US retail channel (Circuit City, CompUSA, even department stores like Sears). The conclusion was if Apple cannot fully control the environment, they cannot create the customer experience they wanted. The store within a store concept helped but they needed more control - particularly Apple employed people to educate customers about their products and distinct advantages over the competition. Non-Apple owned and run stores did not work in the US and certainly will not work in India. The difference in this scenario is that the Indian government is keeping Apple from achieving the same goal. Like China, India is trying to limit the presence and power of foreign companies. Unfortunately for India, this is backfiring, since many of the best and brightest leave their country to live in more progressive countries like the US. Arrogant: That has been my impression in at least half of my visits to my local Apple Store. The "I am right and you are wrong" mentality is very strong -- even when asked why their "facts" differ from those of another Apple employee from the same store! During one drawn out issue of a defective phone being replaced I received 4 different answer from each of 4 different employees -- and each of them insisted that they and only they were correct. That's arrogance. (But that is only in the one store that I frequent -- and I have never, ever experienced any arrogance during any online interaction (support or sales). Not even a shred of arrogance -- quite the opposite actually). Transactional & Impersonal: I seldom find this. But when I do, it is only after being handed off to somebody charged with taking my money after I have decided to buy a product or service. But, other than that, it is almost always the exact opposite: Very warm and personal. 9/10? And are these products across-the-board? iPhones to Macs to cables to chargers? I suspect that that is why Ahrendts moved on from Apple: A shift from sales to support, education and promotion and all of its myriad aspects. A store that emphasizes sales to its employees (even indirectly) will struggle to provide support and promotion of its product. It's why some online retailers are opening brick and mortar store fronts - not to sell their product but to support its customer base and promote its products. This is not just a problem in India. Apple touts it's customer service, but I find Apple Store's service policies to be sub-par. You need to make an appointment for just about everything. They seem to be perpetually behind when you arrive. The capability of much of the staff is not up to snuff. Apple can do better. You can blame Angela for that. She got rid of the long process of vetting potential retail employees and hired whoever. Then she got rid of the training program that Ron and Steve created, and made an accelerated training program that really didn’t teach anything. Exactly right. The burden rests on India's corporate culture and corrupt and overly complicated bureaucracy, NOT on Apple. Though Apple is the easy target for criticism because they're the most visible. Like China, India is trying to limit the presence and power of foreign companies. Unfortunately for India, this is backfiring, since many of the best and brightest leave their country to live in more progressive countries like the US. Indian "nationalism" is the country's greatest weakness. People want blind loyalty and no criticism or introspection. We have tended to be dragged, kicking and screaming, into the future, motivated mostly by the notion that, "But that's the way we've always done it, so that's the only way to do it!" with very few ever asking, "Is there a better way to do this?" When Apple took this approach, they nearly went bankrupt. It was only by constantly working to improve products and services that Apple climbed their way to the top of the heap. If India wants to make it on the world stage in the 21st century, we need to find ways to keep our best and brightest minds here, with Indians developing tech and innovations in India, for Indians. I don't know of any new tech here that we have created ourselves. Pretty much everything has been bought, leased, stolen, or plagiarized from someone else. SIGH. Doing business in countries like China and India is different than USA and Europe. Comparatively, because of Apple's liberal repair/replacement policy, enough wrong doing happens in those countries loosing money on top of poor sale. Chinese and Korean phone companies make/sale phones targeted(larger screen,lower price, OK built) for say India. It is hard to sale at higher price to make money and than keep good customer service. Good customer service directly related to able to make enough money to support it..
"Owners of out-of-warranty products are perhaps more susceptible to the whims of networked service chains. As they are not bound by Apple's pricing policies, authorized repair shops are free to charge markups on parts or charge diagnostics fees, the report said. Further, certain service providers in India do not guarantee that the repair of an out-of-warranty device will be successful." That whole paragraph seems bizarre to me. Are they implying Authorized providers should sell parts at cost and not charge for service time? How can you guarantee an out of warranty repair will be successful? You might open the device and find liquid or other non-repairable damage!